[Ended 2018] Ok, a lunchtime excursion has led me to Roche Brothers grocery store. Hmmmm, looks like they've gotten a fresh shipment of talenti gelato as these frost free containers are sporting the new lid design (but not the new container design(?)). Hmmm, do I go chocolate chip or do I go vanilla since everyone raves about it? 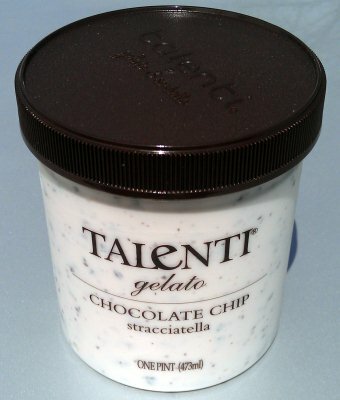 Ok, after comparing the short ingredient list on both containers, I go with Talenti gelato Chocolate Chip Stracciatella. Reminder: this is the last generation container. 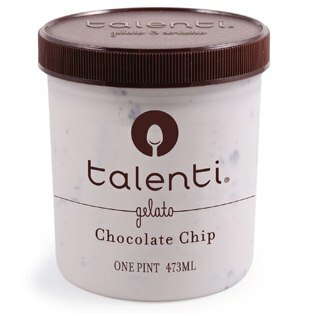 See, this is the new 2013 container that just says talenti gelato Chocolate Chip. Now don't think me dumb, but somewhere along the line I thought Stracciatella referred to some kind of mint flavoring. This is not the case. What is does refer to is smaller chocolate chips intended to meld better with the ice cream. Well, I can honestly say that these tiny chocolate shavings certainly integrate well. You'll never get a huge thud, there's not even really a crunch. It's much more of how the ice cream hits your tongue and leaves little bits behind. I find it amusing since I can't think of anyone who makes a smaller chocolate bit. So I dig in, not knowing whether to expect a straight chocolate chip ice cream or something tweaked. The texture is very soft. 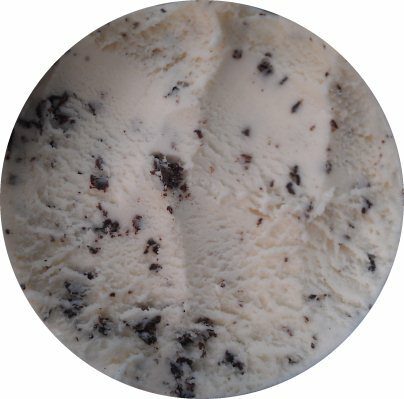 It's a nice product with those familiar chocolate chip shards we've found in other talenti flavors. The base flavor isn't really vanilla, not sure what else it would be though. Ahhh, reading description, it's supposed to be a hint of vanilla. still excellent, still soft, still polished off half the container (the rest for tomorrow). I think the funny thing is how much the soft texture makes me crave a nice, thick milkshake. On Second Scoop: I think the weird thing for a food noob like myself is getting use to eating an unflavored ice cream base. It's something that relies on just the sugar and cream for flavoring. I think it's one of those flavors that you should try at least once if only to expand your understanding of how diverse flavors can be. I don't think I'd rush out and buy it again, but I will definitely get this one when I want to mix things up. Interesting! I might try it even though I have doubts. I did try their pistachio but didn't love it - we have a local gelato shop and its pistachio is far superior. I didn't like the way the pistachios got kind of soft and mealy from being in the gelato. When I bought my Talenti a few weeks ago the lid also had the new design but not the container! Me neither Dubbs I find pistachio repulsive! I'm not really a fan of any nut other than the legume-like peanut in my dessert! HI there. I like your review, and I can share one little tidbit of how this gelato is made. I lived in Italy for a couple of years back in the 80's and there was a gelateria around the corner. I made friends with the owner and one day he showed us how he made the straciatella, my favorite flavor. It's really just the Italian word for chocolate chip ice cream. They aren't tiny shavings of chocolate, as you might imagine, they really just take a small stream of liquid chocolate and swirl it into the gelato as it's almost done, and it comes out as the tiny chips. 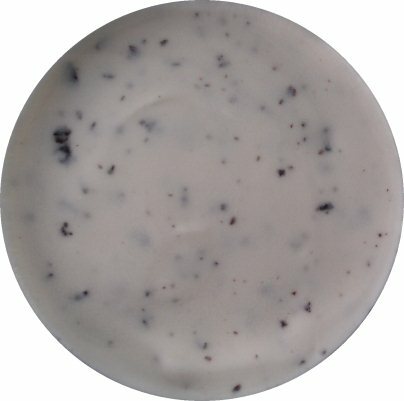 I absolute love it and have been looking for a good pint sized chocolate chip for a long time now. I found this at Safeway. Highly recommended. thanks for the info. I kind of suspected that was how they did it but I wasn't positive. It's definitely a very cool technique that helps set them apart. I kind of wish they would do this to more of their other flavors! I am late to the Talenti craze and have on,y tried mint chocolate chip and now chocolate chip (after finding it for $2.50). Although I had read the review here, I had to try for myself and I loved it. True gelato it is not so I am not a huge Talenti lover, but for what it is, it wS delicious. The vanilla was strong...I could smell it right away and had such a nice flavor. I usually prefer chocolate chunks but I thought the shavings worked well here. It was very hot so it softened quickly, making it super smooth. I'm definitely buying more before the sale runs out!